In case you forgot which green this was, it is this beauty. 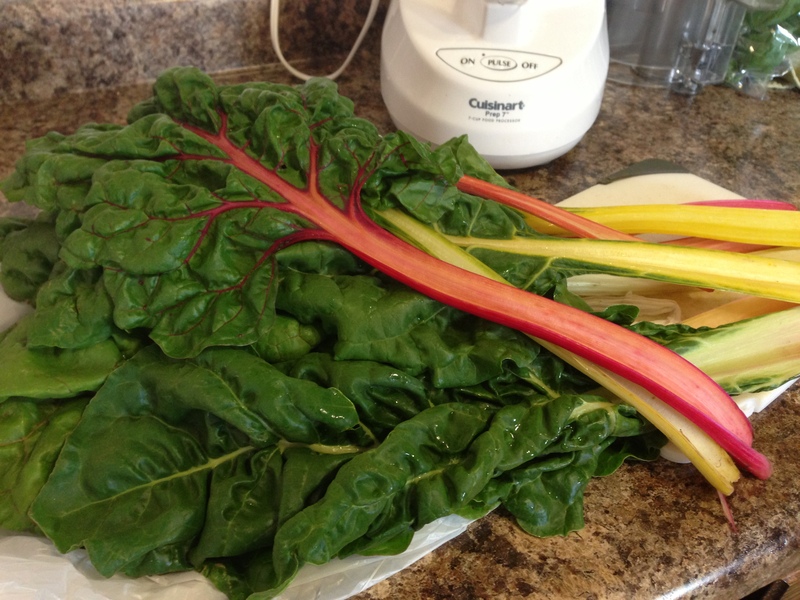 Here’s another Swiss Chard and Garlic Scape post for those of you with more than you know what to do with! I had so much food on hand that I ended up freezing this recipe. Add the scapes, swiss chard, and basil to the food processor. Process until a thick mixture is formed. While processing, pour in the olive oil and lemon juice. Once relatively smooth, add in the beans and process until smooth. Add salt and pepper to taste. At this point you can also add in some fresh Parmesan cheese – I forgot about it, so I didn’t include it in my ingredients. If you don’t plan to eat all the pesto now, consider freezing it for later. Line a baking sheet (or dish) with plastic cling wrap. 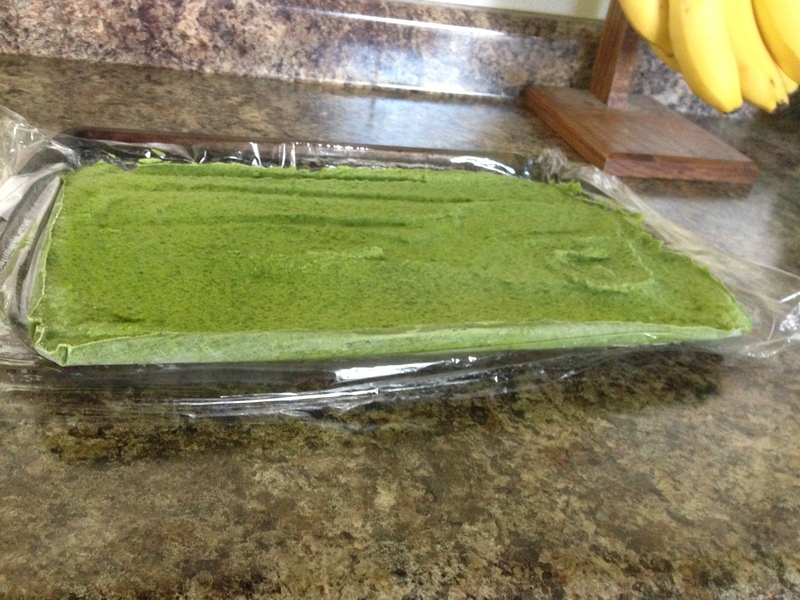 Pour the pesto mixture onto the cling wrap and spread out. Place the pan in the freezer, uncovered, for a few hours, until frozen through. Remove from the freezer and cut into 1″ x 1″ squares. Individually wrap with plastic wrap and place into a freezer bag. Keep frozen until use. This portions come in handy for last-minute meal ideas. Stir cherries, broth, sugar, ketchup, vinegar, chipotle peppers, thyme and allspice in a small deep bowl. Transfer to a shallow non-reactive dish large enough to hold chicken. Add the chicken and turn to coat well. Cover and marinate in the refrigerator for at least 2 hours or overnight. Preheat grill to high. Oil the grill rack. Remove the chicken from the marinade. Transfer the marinade to a medium skillet. Reduce the grill heat to medium and grill the chicken until cooked through and no longer pink in the middle, 7 to 9 minutes per side. Meanwhile, bring the marinade to a boil. Reduce heat to a simmer and cook until the sauce is reduced by about half, 12 to 15 minutes. Let the chicken cool slightly; serve with the sauce. Back in May, a friend of mine (Perky) was amazed to learn how easy it is to make a homemade white sauce. I told him I would be sure to post a recipe for it, but am just now getting around to it (sorry about that Perky). When most people hear of white sauces, they instantly think of phrases, such as, bad food, high fat, taboo, off-limits, indulgence, and forbidden. However, this is far from the truth with homemade white sauces where you can tweak the ingredients as you wish. There are two kinds of white sauces. First, the traditional white sauce, which calls for starch (flour), fat (butter), and liquid (milk). More recently people have tried to make lower-fat versions of this white sauce; a common one is called the slurry-method. This method calls for starch (flour) and liquid (milk) and gives the option of adding a fat source at the end for taste and texture. Looking for a lighter white sauce? Try the slurry method (see below) instead of the traditional white sauce, or make the traditional white sauce a little runnier. Also, you can choose skim milk to cut the calories down. If you are trying to limit saturated fat, but would like to use the traditional white sauce method, opt for canola or olive oil instead of butter. Jason and I were in the mood for a childhood favorite: mac and cheese. However, I am not the biggest fan of the boxed varieties and Velveeta is too rich and heavy. Instead, I decided to make a slurry, add cheese and seasoning and serve over whole grain elbow noodles. The result: perfection! Jason loved it and the minimal leftovers were gone within 24 hours. This homemade version offers the traditional health benefits of macaroni and cheese (calcium and vitamin D) but also has added fiber with the whole grain noodles and less saturated fat than traditional varieties. Slowly add milk in small portions; blend thoroughly after each addition, until all the liquid has been added. Return to a medium heat and stir constantly. Bring to a boil and boil for 1-3 minutes until at 75% of desired consistency. The sauce will thicken more as it cools. Blend the flour and salt with 1/4 of the cold liquid; stir until all umps of flour have been separated. Add the remaining liquid and stir thoroughly. Place the mixture in a saucepan or skillet on medium heat. Add any seasonings being used (i.e. onions, pepper, garlic). Stir constantly and bring to a boil. Boil for 1-3 minutes until at 75% of desired consistency. The sauce will thicken more as it cools. optional: as the mixture boils, add half of the desired fat and blend fully. If still desired, add the remaining fat. Boil noodles as directed on box. Drain and return to saucepan (be sure to place on a cool burner). Prepare the Slurry Method as stated above. Add seasonings and onion at step 3. While mixture is boiling in step 4, add marble Cheddar cheese and stir constantly until fully blended. Add cheese mixture to pot of noodles and stir completely.